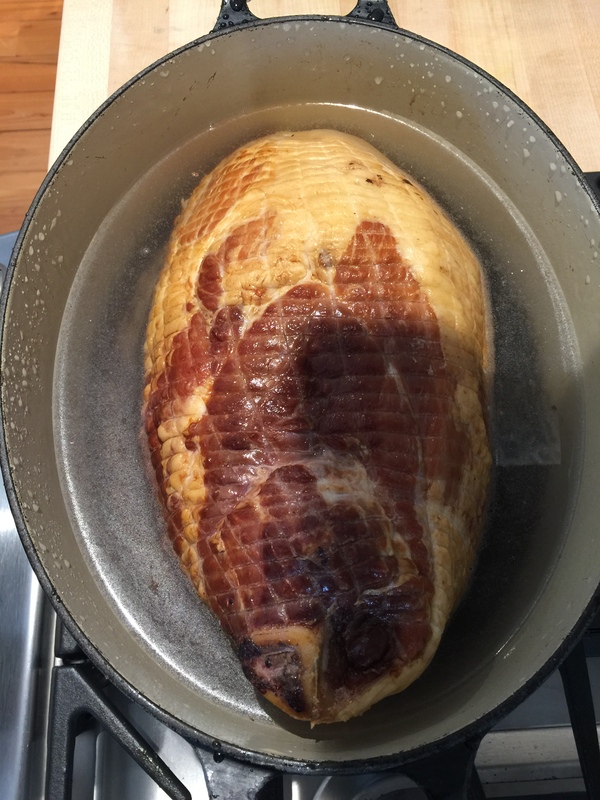 Place ham in a large dutch oven and cover with cold water. 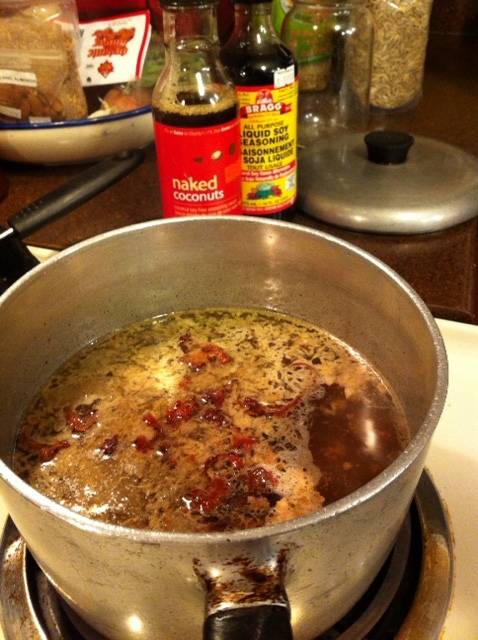 Bring to a boil, and simmer for 1 hour on medium low heat. Make sure to watch water levels, and add more if needed. Preheat oven to 325°F. Using two forks, lift the ham out of the water and place in a roaster. 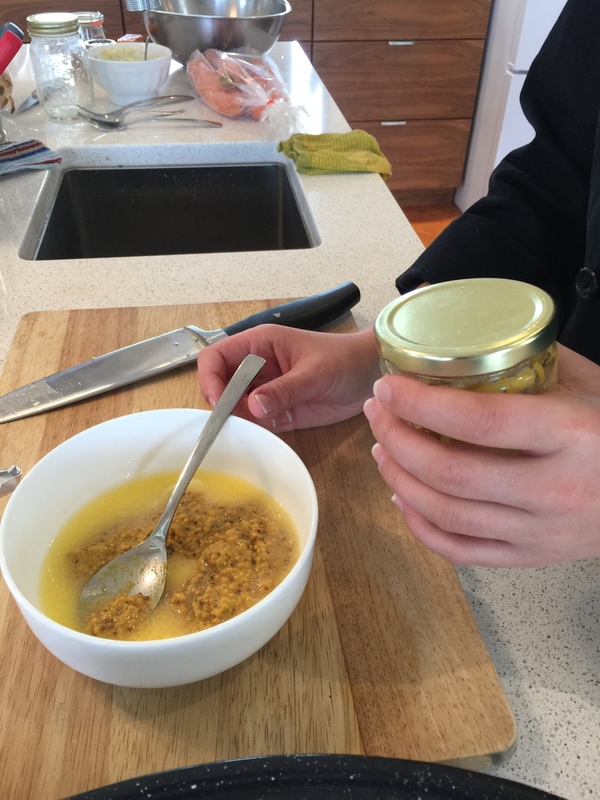 In a bowl, mix together fruit juice, mustard, brown sugar, honey, spices, and pour half the mixture over the ham. Bake for 30 minutes. Add the rest of the glaze, and bake another 15-20 minutes. Slice, and serve! Meanwhile, in a large saute pan, melt the butter and add the onions, celery, apples, parsley, salt and pepper. Saute over medium heat for 10 minutes, until the vegetables are softened. Add to the bread cubes. We have beautiful Tamworth pork which our butcher cuts with the rind on. That means CRACKLINGS!!! To roast a rind on Tamworth roast simply follow these steps brought to you by britishfood.com I have to say, it may take some practice to get the cracklings perfect, but it is soooo worth the effort. My sister in law Sue has it down pat and we all elbow each other out of the way to get the beautiful cracklings that this roast makes. The pork should be at room temperature before you start this recipe. Using a paper towel dry the pork all over including the skin. 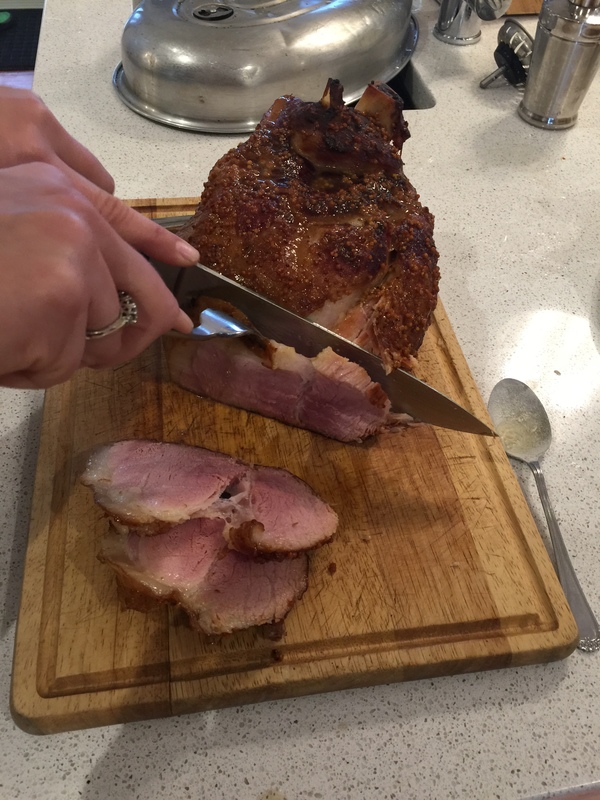 Using a very sharp knife (A Stanley or Craft knife works well) make slashes approx a finger width apart across the skin, don’t cut through to the meat, about half way down the fat is good. Rub the skin with the oil ensuring it goes down into the slashes. Sprinkle with salt, again make sure it is down into the slits. Place the pork into a large roasting tin. Tuck the two onion halves under the meat, this will help keep the meat upright as well as adding flavour to the meat. Cook for 1 hour and 40 minutes. If you are using a larger or smaller joint then cook for 25 minutes per 450g/1lb, plus add on a further 25 minutes. Switch off the oven (unless you need to cook the crackling further, see note below). Remove the meat from the roasting tin and place onto a serving plate, cover loosely with foil and place in the oven with the door slightly ajar. Remove the onion from the pan, then place the pan on the stove top over a high heat until the meat juices begin to bubble but not burning. Add the flour, and stir to blend into the meat juices. 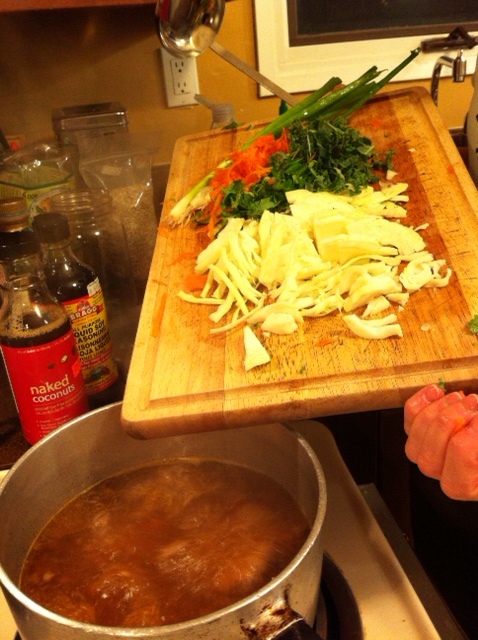 Pour in the cider or wine and scrape all the juices from the bottom of the pan, reduce to a sticky glaze. Do not leave the pan unattended as the reduction happens very quickly. 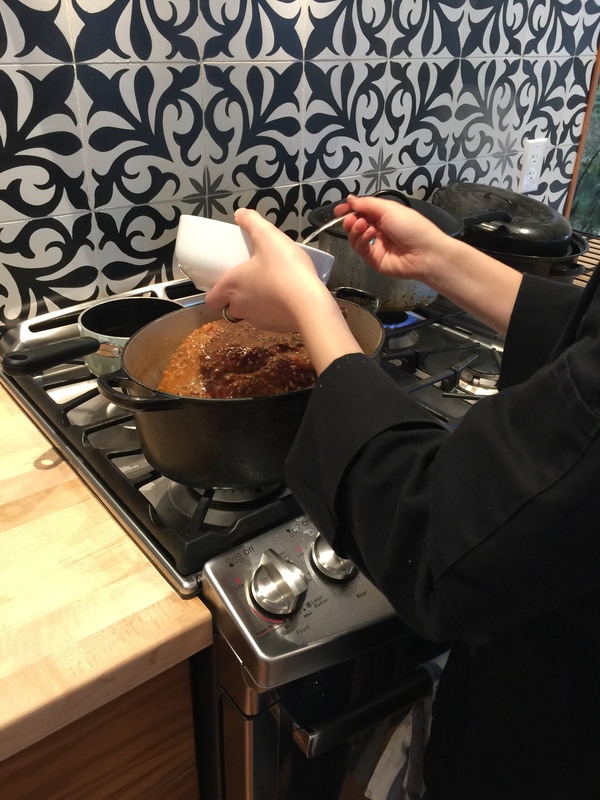 Strain the gravy through a fine sieve into a saucepan and reduce by one-third. Add the butter in tiny pieces shaking the pan gently until the all the butter is absorbed. Keep warm until needed. Remove the crackling from the pork and carve into thick slices. All of the pork that we sell at Crampton’s is freely ranged. That means that the sows (momma pigs) are never caged, and their little ones run wherever they wish…including outside of the fenced areas much to the chagrin of our farmers. Because these hogs are actually moving around and exercising, the meat that they produce will be slightly more firm and juicier than conventionally raised hogs. Feel free to cook all of our pork products as you would conventionally raised pork. No special temperatures or treatments required. As you may have noticed we can get really really busy at the store. Not to get graphic, but there are some days where I have to hold a pee for 3 hours before I can find the time to go. The phone is always ringing, orders are always being delivered, customers and staff always have questions that need an answer, and disasters always need averting. This makes cooking a meal very challenging. I see lots of busy working Moms and Dads at the store whose lives must be as hectic as mine. THIS is the meal for you. It’s just food in a pot, and it is DELICIOUS and EASY! Look in your fridge. Have some green onions that are going wilty? A yellow or red onion that is going soft? Clean it up, chop it up and put it at the bottom of a heavy pot. Chuck in a few cloves of garlic. Sometimes I peel them, sometimes I don’t have the time. Sometimes I then put a layer of baby potatoes, if I don’t have the time to wash potatoes, I leave out the potatoes. But if you can, add them next, they are very tasty at the end. I make my next layer Kale or Swiss Chard. If I don’t have the time, I don’t de stem either the kale or chard. Sometimes life is just too busy to destem things. On top of the kale and/or Swiss chard I place whatever soft veg we have kicking around. It could be zucchini, sweet peppers, whatever you have lying around that is looking a little less than prime. Prime veg is great too, but this meal in a pot is also a great fridge clean out method. Chop it up and layer it on top of your greens. The next layer should be a pork sausage. Bison and grass fed Beef are just too lean for this dish. I used our Berkshire hot italian sausage, but any pork sausage will do. We’re busy here at the market, so I just usually chuck them in the pot frozen. I use 2 packs of sausage. On top of the sausage, I pour 1-2 pints of cherry tomatoes. This should bring your big pot to heaping full. I drizzle a bit of olive oil on top of it all, add whatever herbs I have kicking around put the lid on and pop the pot in the oven at 350 degrees for about and hour and a half. (At the store we have a convection oven, so this cuts down our cooking time to about 45 minutes) After 45 minutes, I take the lid off of the pot, move my once frozen sausages into a better less clumped together position, and put it back in the oven, for another 30 minutes. Then I remove the lid, and put it back into the oven until the tomatoes and sausages are slightly browned, about 10-15 minutes. The tomatoes burst and drizzle down over everything, the sausage does the same thing. 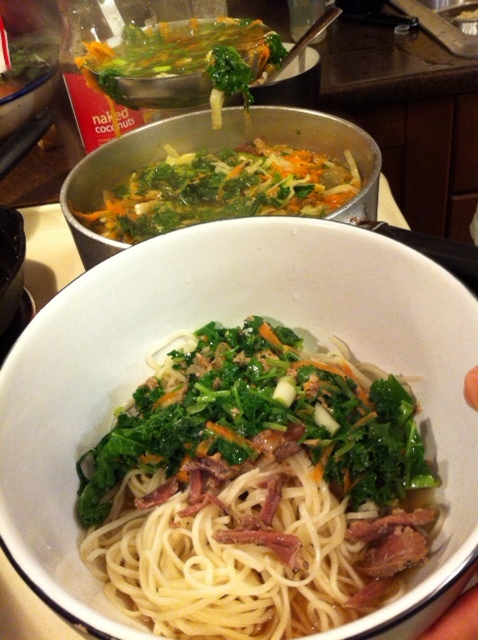 At the end you end up with tasty potatoes in sauce at the bottom, delicious braised kale in the middle, veggies and meat! It’s food in a pot. It’s always delicious but especially so if you haven’t eaten for 13 hours that day.